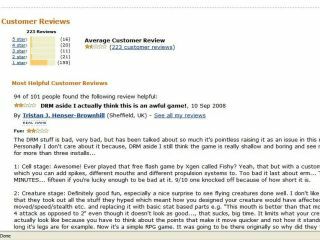 Customers of EA Game's Spore have been showing their huge ire at the game's DRM on Amazon through poor customer reviews, which Amazon 'accidentally' took down for a short period. Although they have since been restored, the deletion meant that would-be buyers were spared reading the anger of other customers, who gave Spore a one-star rating on average. Users were annoyed at the fact the product could only be installed three times on a PC, which means that hard-drive formatting or uninstalling are going to use up one 'life'. The only way to reactivate the game is to call up EA and explain the situation, something that Arstechnica says is "an interrogation of sorts". The same sites also reports that the problems were nothing more than a 'glitch': "The team is working to resolve this issue now and have all the reviews back up on the site," a spokesperson told Arstechnica. "Amazon doesn't censor or edit customer reviews based [on their content] and we'd only remove a review if it fell outside our guidelines." However, there's no word on whether sales were affected during the outage, but there are now 223 customer reviews on Amazon.co.uk, with an average rating of 1.5 stars, so customers are still voting with their mouse it seems.